"The Invaders" is the 74th Mandrake Sunday story. The story was written by Lee Falk and drawn by Phil Davis. Two scouts from an alian invasion fleet come from a distant star to conquer the Earth. Province 7W81, third planet, Cyni 11. X6-Z4@N, an alian scout ship. 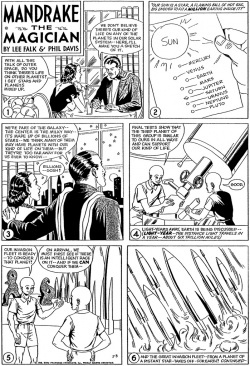 The story title is taken from the strip of December 29, 1957 (Next Week: The Invaders). Narda is five feet five inches high. This page was last edited on 4 November 2018, at 18:36.